FOR A FEW SECONDS THERE, I searched the dictionary of my brain for that word which temporarily eluded me. Collage. That would be it. Remember when that art form was especially popular, when, as a school assignment, you had to scrounge up ten zillion magazines and then snip out images themed to a specific subject and glue it all in a jumbled mess onto a piece of paper? Today I present a collage—not a jumbled mess, though—of art. Let’s take the biggest focal piece first. A Hudson. 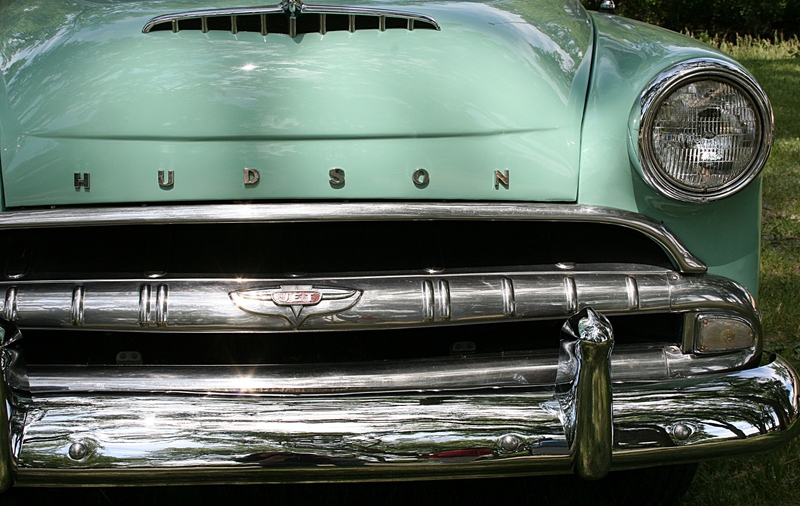 A Hudson, like this one I photographed several years ago at a Faribault car show, centers “The Car.” Do not expect, though, to see a real Hudson on stage, only the shape of one. The Hudson centers the stage at the Paradise Center for the Arts during a production of The Car by Carol Wright Krause. My husband and I saw this play by the Faribault-based The Paradise Community Theatre Friday evening. I’d rate it as one of the best I’ve ever seen performed locally. The Car is about a family’s car, which as Ed (a character in the five-person drama) puts it “is a miracle of modern American engineering.” This miracle car is a character in itself, a highly theatricalized version of a 1954 Hudson. It takes us on a journey into the lives of the Banners and the challenges an all American family faces as they struggle through two decades of change at home and abroad. We will see how they choose to overcome such difficulties. Now, why am I so enthusiastic about The Car? Because it moved me to tears. When a theatrical performance can evoke such a strong emotional reaction from me, I will embrace it with unbridled enthusiasm. That break-down moment for me came near the end of the play, when Vietnam War veteran Hal Banner (played by Todd Ginter), broke down in the arms of his father, Ed Banner (Chuck Larsen). He was no hero, Hal said, pointedly telling his father that he (Ed) would never understand the horrors of war. And then Hal got specific, talking about seeing the eyes of those he killed. That’s when the tears trickled down by cheeks and I struggled mightily to keep from sobbing. In that moment, I heard my Korean War veteran father, not Hal/Todd. My dad, too, spoke of seeing the eyes of those he killed on the front lines in Korea. Later, when I congratulated Todd on his performance, he told me that he had talked to several veterans in preparation for his role. And it was the eyes which they spoke of and which he knew he needed to emphasize in that heartrending father-son conversation. It is easily the most powerful moment in the play. I wondered how many audience members might be veterans and at that moment suppressing war memories and feelings, as my father did. But this play is about so much more than war. It also addresses the issue of prejudice when Hal brings home a Japanese wife, portrayed by Carrie Jendza whose mother came here from Korea some 40 years ago. Carrie presents a stunning performance as do Susan Dunhaupt as Ed’s wife, Geneva, and Faribault High School sophomore Emily Remmey as Beth Banner, Hal and Sumiko’s daughter. The prejudice starts right away when Ed Banner insists on calling Sumiko the Americanized “Sue.” He slides in references to “slant eyes” (there’s the “eye” thing again) and other derogatory comments. In real-life, prejudice is an issue in Faribault, home to many Latino, Somali and Sudanese family. It is no secret that prejudice exists in my community. You can read about it in a previous post by clicking here. I didn’t spot a single minority in the audience Friday evening, not unusual despite Faribault’s sizable minority population. There, that’s all I’m telling you about The Car, other than to advise you to see this powerful and memorable production. It’s community theater at its best for the superb acting and the unforgettable messages delivered. 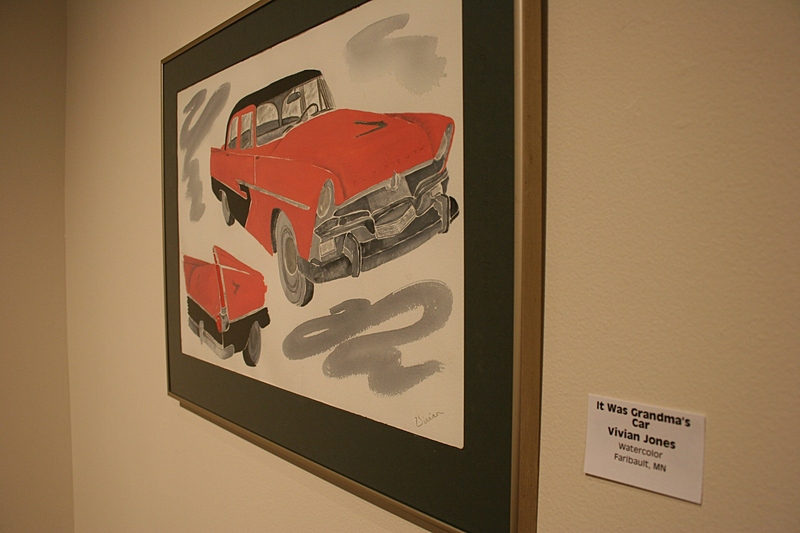 Faribault artist Vivian Jones created this watercolor, “It Was Grandma’s Car,” for the current “car pARTS” show. Additional performances of The Car at the Paradise, 321 Central Avenue, Faribault, are set for 7:30 p.m. on September 15, 20, 21 and 22 and at 2 p.m. September 16. Call (507) 332-7372 or click here to reach the Paradise website. According to info published in the theater program, production of The Car is made possible through a Minnesota State Arts Board Operating Support Grant. While you’re at the play, be sure to check out the exhibit, “car pARTS,” in the Carlander Family Gallery. NOW LET’S PLACE another piece in that art collage. On-air poetry. 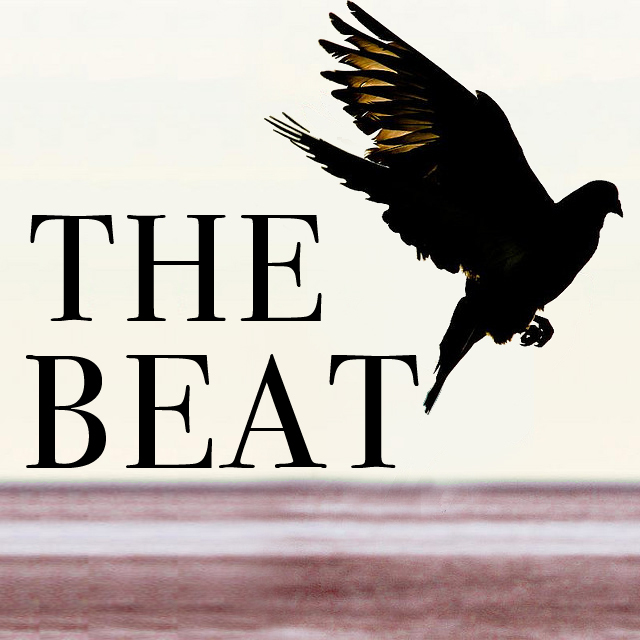 In July, Northern Community Radio began airing poetry on its weekday morning show during a segment called The Beat. 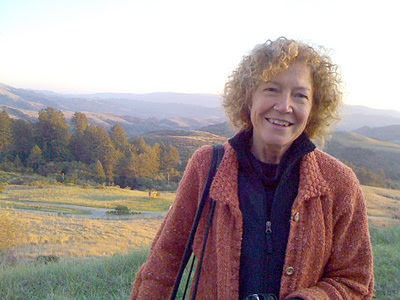 On Monday my poem, “Her Treasure,” will air on 91.7 KAXE (89.9/Brainerd) and on 90.5 KBXE. Now I won’t be able to listen to whomever reads my poem between 7:30 a.m. – 8 a.m. and again between 3:30 p.m. – 4 p.m. Faribault is well outside the coverage area which extends from Thief River Falls to Hermantown to Pierz. Eventually, though, I’ll be able to listen to the reading of my poem online. I’m in the company of some mighty fine poets, from novices to Minnesota’s 2011 poet laureate, Joyce Sutphen, to well-known Minnesota writer Will Weaver. 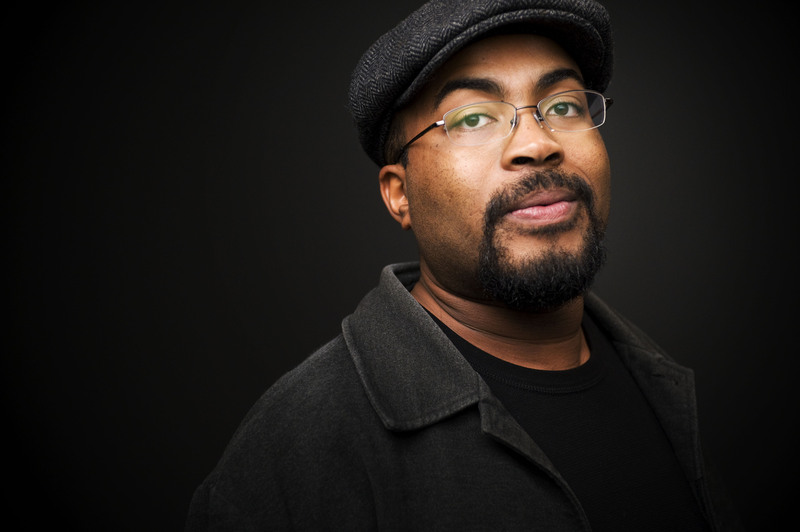 You can check out the current listing of The Beat poems/poets by clicking here. 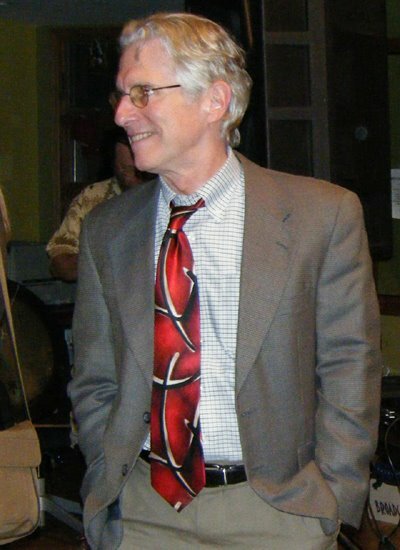 The poems chosen for airing were selected through a juried process. 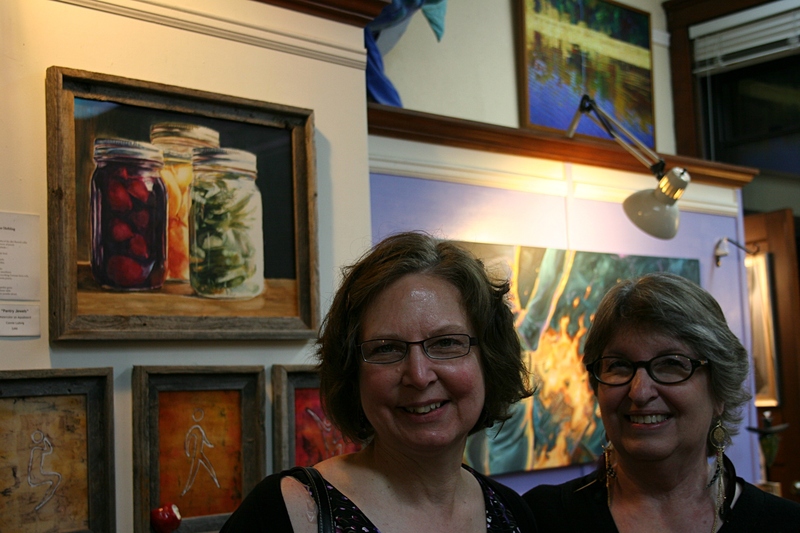 Connie Ludwig, right, and I pose for a photo with her watercolor, “Pantry Jewels” (above my head) inspired by my poem, “Her Treasure.” This photo was taken in April at Crossings at Carnegie in Zumbrota. Just, FYI, “Her Treasure” is the same poem featured in “Poetry Artist Collaboration XI” at Crossings at Carnegie in Zumbrota last April. To read my poem, click here. You can expect a forthcoming detailed post from me on this project funded by Minnesota’s Arts & Cultural Heritage monies. 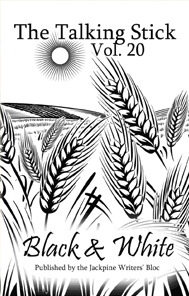 The cover of last year’s The Talking Stick 20. NEXT, LET’S PLACE the third piece in this arts collage. More poetry, plus fiction and creative nonfiction. Today I’m missing out on a book release party for The Talking Stick 21 in the Park Rapids area. This anthology, published by The Jackpine Writers Bloc, represents some fine writing by Minnesota writers. You can, referencing back to The Beat, listen to the poetry of Sharon Harris, a Jackpine member and one of the key producers of the collection. I’ve been published in two previous volumes of The Talking Stick (including receiving an honorable mention for my poem, “Hit-and-Run,” in volume 19) and will be published again in this newest volume. My poem, “Broken,” was chosen from among 275 submissions for publication. To learn more about The Talking Stick, click here. To learn more about The Jackpine Writers’ Bloc, click here. THAT’S IT. Now, go ahead, add your own pieces to this art collage via your comments.